Step outside the potato chip bag and enjoy BBQ-flavored crickets from Exo. With every mouthful, you get a tangy, sweet, and smokey BBQ zing that will keep you reaching for more. Eating eco-friendly never tasted so delicious! Crickets have protein to spare and are a great source of the vitamin B12, making them excellent fuel. This delicious, healthy snack is not only a great alternative to your favorite unhealthy party foods, it’s also the ultimate super-food for hiking, running, or any other of life's adventures. 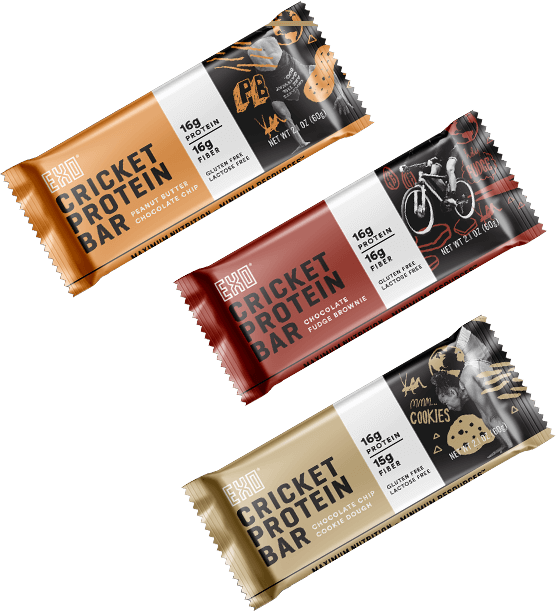 Take your health and eco-friendly lifestyle to the next level with our tasty BBQ crickets, Protein Bars, or Protein Bites today. If you are just beginning on your health food journey, hop on over to our “Why Crickets?” page to learn more about what motivates us to create these revolutionary snacks. *No Wheat, Soy, Milk or Egg ingredients. Crickets. The closest thing to a perfect protein source this planet has ever seen. Turn these sustainable wonders into powder, add wholesome ingredients like dates and cocoa nibs, and you’ve got some damn delicious fuel. Most of the world has joined the bug-eating revolution—we’re here to convert the rest. If our products let you down, we will refund you, no questions asked. If you have a problem with your order, please email info@exoprotein.com within 2 weeks of delivery. 3 delicious flavors. 16 grams of protein. Nutritious and Sustainable.